I took this photo 102 weeks ago ..
Yep! I actually took the time to gather up 36 pairs of my athletic shoes so I could take a photo and I would have had more than the ones pictured. I’d hazard a guess and say these were probably the shoes I could find around the house and since today I have 5 pairs of sneakers in my car I doubt much has changed in the way I use my car as a mobile wardrobe. At the time I made a concerted effort to down size my shoe collection, I mean honestly who needs that many pairs of sneakers! I gave some to a hurricane relief fund that were collecting sport shoes (through my gym) and gifted others to charitable organisations in my community. Then I took up crossfit and “had” to add not only lifting shoes but multiple pairs of Nano’s so suffice to say, the last thing I really need is more shoes. 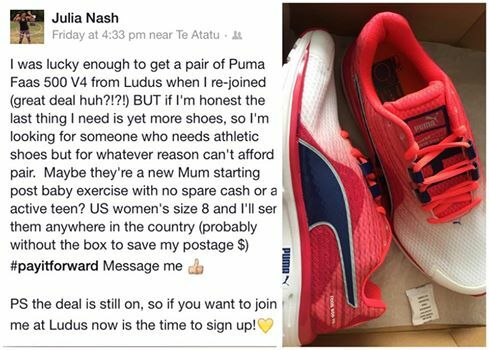 So when I received a pair through a promotion that Ludus were running I decided that instead of adding another cute pair of my shoes to my ever burgeoning shoe collection that I’d #payitforward and find someone who could REALLY use them. Seek and you shall find ..
A few hours after putting out the call, I’d found the perfect recipient. A friend of a friend had just had a baby and was trying to exercise by walking with her baby, it seemed rather apt since that had been me 5 years ago. I sent off the surprise package with a handwritten note from me explaining that I had more than enough shoes and that a little birdie had told me that she could put this pair to good use, all I asked was that if they didn’t fit her OR if she had a thing against pink (like anyone would), could she pass them onto someone who needed athletic shoes but couldn’t for whatever reason afford them. The next day I received an email thanking me for my generosity and telling me that she’d make good use of them, a few days after she even sent a photo. In no way am I telling you this expecting a pat on the back, I’m telling you this to show you just how easy it is to #payitforward. It didn’t seem like a big deal to me, I had more than I needed and I bet someone out there didn’t – and I was right. Obviously, you don’t need to give away brand new shoes. I gave my cousin a pair of lightly worn Nikes after she’d shown interest in the Pumas (but I’d already re-homed them) and she was just as ecstatic to receive her surprise gift as the recipient of the brand new shoes I’d sent out. Your gifts don’t even have to be material ..
Have you ever received a genuine smile from a stranger? I have and they always brighten my day. Next story Train to live or live to train?